Executed in New York in May of 2016, the present work is a variant edition with each work being unique in the placement and density of the red dot. 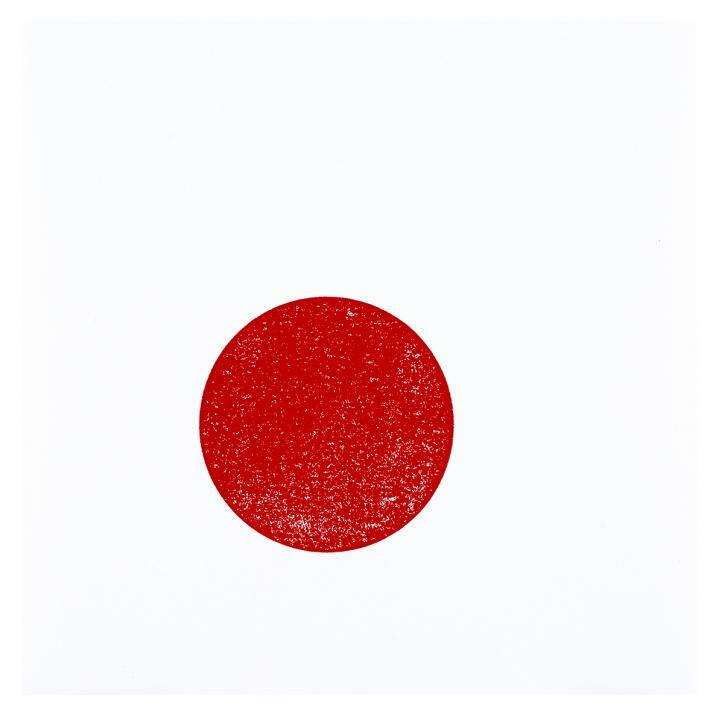 Rubber stamp print printed with Warm Red Van Son Rubber Based Letterpress ink, a fine, fresh impression, the full sheet, printed on smooth white 335gsm Coventry Rag, hand-signed, dated, titled and numbered in pencil on the reverse, executed in a variant edition of 60 examples (there were also X numbered and annotated Artist's Proofs, 10 numbered and annotated HC proofs, 2 numbered and annotated Printer's Proofs, 1 annotated proof for the archives of the Cabinet d'arts graphiques, Geneva and 1 annotated BAT proof), printed by the artist with the assistance of Brad Ewing at The Grenfell Press, New York, published by World House Editions, Middlebury, Connecticut, in fine condition, unframed. Tallman, Susan. "Dot Dot Dot," article in Art in Print, Volume 6, Number 6, March-April 2017, pp.26-27, illustrated p.27 (another example). Staff. "News of the Print World: Selected New Editions", article in Art in Print, volume 6, number 2, July-August 2016, p.53 (another example). The size of the image is 3 1/2 inches (8.89 cm) in diameter.